Invited speaker, Human Rights Day 2018, Hunter College High School, Fall 2018. In conversation with David Engerman, NYU Cold War History Seminar Book Series, Fall 2018. Invited speaker. “Beyond the Nation: Ambedkar and the Anti-Isolation of Fellowship,” paper co-authored with Anjani Kapoor, Draper Workshop on the History of Human Rights, Panel organized by Manisha Sinha, with Sam Moyn, Glenn Mitoma, and Amy Dru Stanley, Fall 2018. Orientation panelist, Luce Scholars National Incoming Cohort 2018, Summer 2018. Discussant, Alanna O’Malley, “Liberal World Order: The Global South and the United Nations, 1955-1981,” at the Cold War History Seminar at NYU, Spring 2018. Keynote speaker (by invitation). “The Nehruvian Legacy.” Event to launch the Indo-US Democracy Foundation, a new think tank, Fall 2017. Media coverage: The Indian Panorama, India Abroad, India West. Invited speaker. “Beyond the Nation: Ambedkar and the Anti-Isolation of Fellowship,” paper co-authored with Anjani Kapoor, at the Quest for Equity: Revisiting Ambedkar, Reclaiming Social Justice International Conference, Bengaluru (Bangalore), India, Summer 2017. Speaker, book launch of Basharat Peer’s A Question of Order, co-sponsored by the New America Foundation NYC and The India Center. Other panelists included Sheri Berman and Elmira Bayrasli. March 2017. Invited speaker, Conference on “The Rise of International Authoritarianism in the Western Balkans.” Spoke about the rise of authoritarianism globally. Harriman Institute, Columbia University, October 2016. Moderator (by invitation), “Kashmir: Past, Present, Future.” Panel at the third annual Indo-American Arts Council Literary Festival, NYU, with Rakesh Kaul and John Isaac, October 2016. Invited speaker. “India, Internationalism, and World Affairs.” The Takshashila Institute, Bengaluru (Bangalore), India, Summer 2016. Read the press release here. Listen to my follow-up podcast, speaking on the rise of global authoritarianism, here. Invited speaker. “Thoughts on the U.S. Elections.” The Center for Canadian, US, and Latin American Studies, School of International Studies, Jawaharlal Nehru University (JNU), New Delhi, India, Summer 2016. Invited speaker. “Gandhi and Interwar Internationalism.” CIPOD, School of International Studies, Jawaharlal Nehru University (JNU), New Delhi, India, Summer 2016. Invited speaker. “India, Internationalism, and the Modern World.” KNH India, New Delhi, Summer 2016. Invited speaker. Delivered “Indian Foreign Policy and Global Change: Multilateralism from Nehru to Modi,” UConn, co-sponsored by the United Nations Association of Connecticut; Citizens for Global Solutions, Mansfield; and the Asian and Asian American Studies Institute; Storrs, CT, March 2016. Details here. Invited speaker. Book presentation/brown bag lunch on The Peacemakers / India and the Quest for One World, World Federalist Movement-Institute for Global Policy Annual Council Meeting, United Nations Church Center, New York City, November 2015. Details here. Invited speaker. Delivered “India Awake? The Promise and the Peril of Recent Elections in the World’s Largest Democracy,” The World Affairs Forum, Great Decisions series, co-sponsored by the Foreign Policy Association, hosted by the Greenwich Library, Greenwich, CT, February 2015. Details here. Co-organizer (with Syed Akbar Hyder) and speaker, Jashn-e Gail Minault Conference, South Asia Institute, The University of Texas at Austin, February 2015. Details here. Invited speaker. Delivered “Towards Universal Relief and Rehabilitation: India, UNRRA, and the New Internationalism,” Department of History and the Institute for Humanities Research, University of California at Santa Cruz, February 2015. Details here. Invited speaker, International Honors Program (IHP) Human Rights/SIT Study Abroad, delivered seminar on the history of human rights, New York, January 2015. Moderator (by invitation), “Women Who Lead,” Conversation with Ambassador Nirupama Rao, 10th Media India Lecture, Consulate General of India, New York, December 2014. Details here. Sample media coverage here. Watch a condensed video version of the event here. 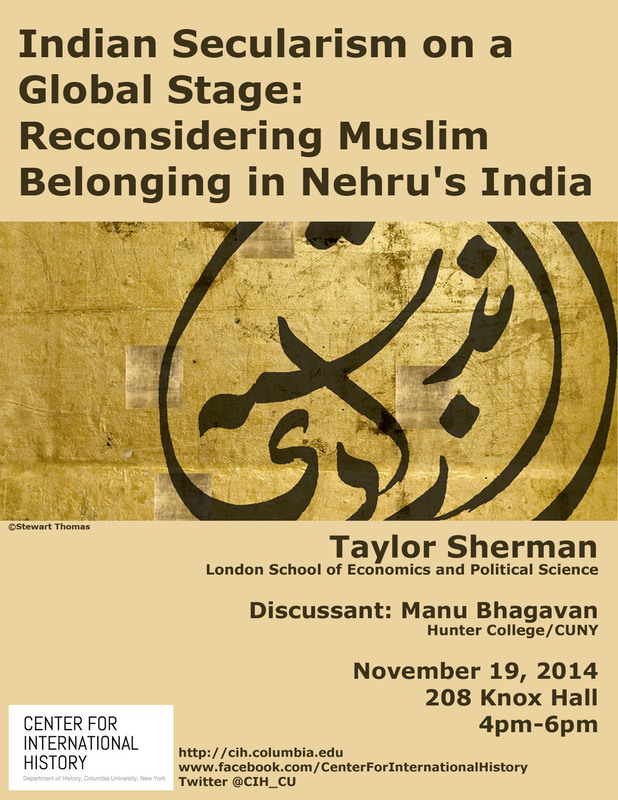 Discussant, “Indian Secularism on a Global Stage: Reconsidering Muslim Belonging in Nehru’s India,” presentation by Taylor Sherman (LSE), Center for International History, Columbia University, November 2014. Poster here. Discussant, “Shadows of Universalism, other Cosmopolitanisms,” with Samuel Moyn (Harvard) and Lydia Liu (Columbia), moderated by Gary Wilder (GC), Humanity Seminar, The Committee on Globalization and Social Change, CUNY Graduate Center, October 2014. Download poster here. Discussant, Book release of The Past Before Us, with Romila Thapar (author), David Ludden (NYU), and Barbara Kowalzig (NYU), April 2014. Invited speaker, delivered paper on “K.M. Munshi and the Origins of Fundamental Rights in India’s Constitution,” (via Skype due to weather) at the Conference on Human Rights Constitutionalism: Global Aspirations, Local Realties, Rapoport Center for Human Rights and Justice, University of Texas School of Law, February 2014. Invited speaker, IHP Human Rights/SIT Study Abroad, delivered seminar on the history of human rights, New York, January 2014. Speaker/contributor, “India and the United Nations,” author’s conference, OUP Handbook on Indian Foreign Policy, New Delhi, Co-sponsored by the Centre for Policy Research and the Observer Research Foundation, January 2014. Speaker, plenary panel on the future of liberal arts higher education in India, Raman Research Institute Conference (Bangalore) co-sponsored by Yale University and Pomona College, January 2014. Book discussion of The Peacemakers, SOAS, University of London, October 2013. Invited participant. Delivered paper on India and UNRRA at the “Wartime History and the Future United Nations” author workshop, SOAS, University of London, October 2013. Invited speaker. Delivered a paper entitled “K.M. Munshi and the Origins of Fundamental Rights in India’s Constitution” at the “Fortunately There were Rebels,” Workshop on the Constituent Assembly of India, Princeton University, October 2013. Invited speaker. Book discussion of The Peacemakers. South Asia Seminar, St Antony’s College, University of Oxford, November 2012. Invited discussant, book launch of Ananya Vajpeyi’s Righteous Republic, at New York University. Other panelists included David Ludden (NYU), Gyan Prakash (Princeton), and Sanjay Reddy (New School). Fall 2012. Multiple events in India related to The Peacemakers release, Summer 2012. Invited speaker. “India, Human Rights, and the Search for Global Government.” King’s College, London, India Institute. Chaired by Sunil Khilnani. Pratap Bhanu Mehta and Ambassador Shyam Saran, discussants, June 2012. “Emerging Economies in Global Governance: An Indian Perspective (A talk by Ambassador Shyam Saran). Discussant with Pratap Bhanu Mehta; panel chaired by Sunil Khilnani. King’s College, London, India Institute, June 2012. Invited speaker, Discussion of The Peacemakers: India and the Quest for One World, NYU Global South Asia Conference, February 2012. Roosevelt House Public Policy Institute at Hunter College, Conversation with Madhusree Mukerjee, author of Churchill’s Secret War, October 2011. Committee on Religion, delivered a presentation entitled “K.M. Munshi and the Problem of Gandhism,” Spring 2011, CUNY Graduate Center. Roosevelt House Seminar on Human Rights, delivered talk on India and human rights, Spring 2011, Hunter College. Invited speaker, The Institute for Defense Studies and Analyses (IDSA), New Delhi, delivered a presentation entitled “Uniting Nations 2020: A Decade-long Vision for India’s Relations with the U.N.” Part of IDSA’s National Strategy Project, December 2010. Invited Commentator, Global Intellectual History Conference, Co-sponsored by New York University and Columbia University, “Conceptualizing a Global History of Fascism,” Spring 2010. Invited speaker, Society of Indian Academics in America. “Internationalizing India: Gandhi, Nehru and Universal Human Rights.” Spring 2010. Invited speaker, The Gandhian Forum for Peace and Justice at William Paterson University of New Jersey, 1 October 2009. Spoke on “Gandhi and Human Rights” in a lecture commemorating Gandhi’s birth anniversary. Co-organizer with John Wallach. Human Rights in the Undergraduate Curriculum: Marking the 60th Anniversary of the Universal Declaration of Human Rights. 10 December 2008, Hunter College. Co-Moderator, with Anthony Browne, “Diversity in Undergraduate Curricula in Higher Education: A Conversation with Lani Guinier and Johnnetta Cole.” 25 September 2008, Hunter College. The Dynamics of Diversity: Narratives of Pluralism in South Asian History, Indiana University (Bloomington), February 2003, conference organizer, chaired panel on “Narratives of Pluralism.” Also organized as a panel at the 2003 Annual Meeting of the Association for Asian Studies. The panel was awarded “South Asia Council designated panel” status.